Two very strong tropical cyclones recent came onshore. Patricia slammed into a sparsely populated area of Mexico, while Chapala hit the war-torn area of Yemen in a very rare landfall on the Arabian Peninsula. Here are some images from the two storms which give you an idea of the impacts of the strong winds on these areas. Jason Samenow of the Capital Weather Gang posted this article linking to a scary 16 minute long video on the landfall of Hurricane Patricia taken by some extreme storm chasers. I don’t advocate storm-chasing because of the danger you pose not only to yourself but to others who may try to copy what you do with little understanding of the seriousness of the situation. In addition, particularly in the case of tornado-chasing in the US, storm chasers have sometimes impeded emergency personnel from getting to disaster sites by clogging roads, even though I think responsible storm chasers try to keep out of the way of emergency vehicles. Storm chasing is particularly difficult to do in the Southeast because of the lack of regular grids of roads, significant topography, and storms that tend to be wrapped in rain, making them hard to see. 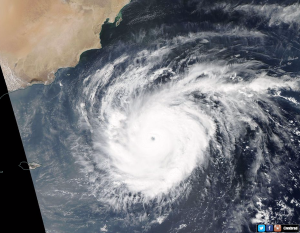 Andrea Thompson of WxShift provided some imagery of Cyclone Chapala as it approached Yemen and flooded onshore, including some video of the high waves experienced there at this link. Bob Henson of the Weather Underground blog also provided some historical perspective on Chapala here.